Bike Index is over the moon to announce our newest university partner: the Pennsylvania State University. Our new partnership with this Big10 school heralds a number of improvements in Bike Index offerings for universities, based on constructive feedback and requests from the Penn State Transportation Department throughout the build process. "We’re excited to partner with Bike Index to provide Centre Region cyclists with a more intuitive and effective bike registration and recovery service," said Cecily Zhu, the Alternative Transportation Program Coordinator at Penn State. Penn State University made the campus announcement last week that their new PSU registration is live. Penn State has made this service available for anyone in the entire Pennsylvania Centre Region. 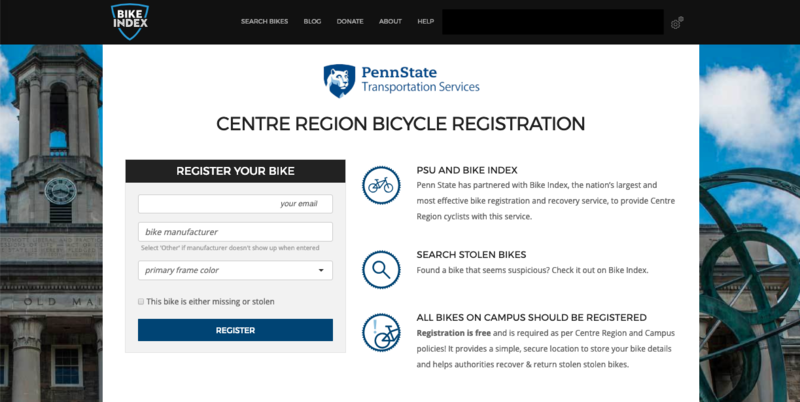 Users can register their bikes from the PSU portal, and Bike Index provides the tools for Penn State to link stickers to registrations and easily mail those stickers out to residences. The stickers and the custom Bike Index-built backend allows officials at Penn State and throughout the Centre Region to communicate directly through Bike Index when they find a bike somewhere it shouldn't be, for instance, in a bush or locked to a tree (yes, I did this in college). Each municipality within the region can use Bike Index to communicate with cyclists and handle bikes as needed, as fits within their municipal policies. At Penn State for example, instead of tagging a bike with a piece of paper, officials can message the bike owner to give them a chance to retrieve their bike. This service will cut back on abandoned bikes and create an online record of abandonment locations. Because Penn State registers all of the bikes not only on their campus but also in the surrounding Centre Region, they needed a streamlined tool for registration and for making sure they stay in the right hands. Bike Index has built the tools to get stickers to bike users quickly. Penn State admins can link stickers to bikes and then create mailing labels so they can distribute stickers to addresses in users' registrations. Penn State joins a growing network of Bike Index university partnerships, and Bike Index continues to innovate solutions for campuses that need custom solutions for bike registration. If you're a university looking to improve your registration system, get in touch with us today. No more waiting for students to come in to register their bike or pick up a decal.